On the flip side, nuts--as well as grains, legumes, and seeds--contain chemical compounds known as phytates, which are "anti-nutrients." These anti-nutrients bind with minerals so that our bodies can't absorb them. Some animals produce enough phytase, an enzyme that breaks down phytates, to allow them digest nuts and seeds and score the nutrient bounty. Sadly, humans do not, and nuts can be hard for us to digest, which is problematic for a couple of reasons: you don't get the full nutritional value, and undigested food that makes its way to your intestinal tract can contribute to a host of health issues, from gas and bloating to leaky gut. Soaking nuts gets us around these pesky issues by neutralizing anti-nutrients and allowing minerals to get unhooked from phytate so that they can be freely utilized by the body. Phew! Now that we've got that out of the way, let's get to my favorite part: chowing down. 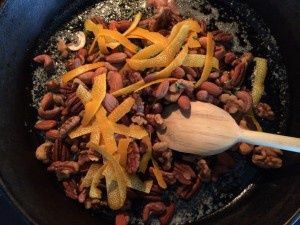 I've been making variations of this nut mix for several years now, and it's always a huge hit at the holiday snack table. Place mixed nuts in a bowl and add enough water to cover. Add salt and stir to combine. Allow nuts to soak overnight. Drain nuts and either dry in a food dehydrator or spread on a baking sheet and dry in the oven at a temperature between 120-150 degrees Fahrenheit. Test the nuts after about 5 or 6 hours, though they may require 12 or more hours to be fully dry and crispy. 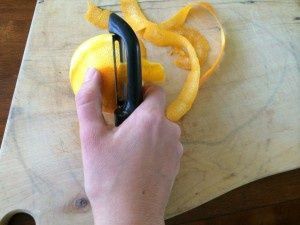 Peel the orange using a vegetable peeler, taking care not to get to the pith (white) layer. 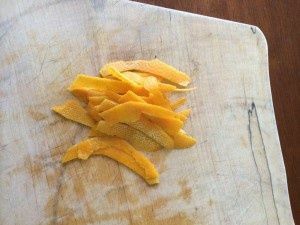 Cut the orange peels into slightly smaller strips, but no smaller than about ½ inch wide x 2 inches long. Melt the butter over medium heat in a large skillet. Stir in the maple syrup and orange peels. Allow to cook for about 5 minutes, stirring frequently. Add the rosemary and cook for another 2 minutes. Add the nuts and toss to combine. Cook for 1-2 minutes more. Sprinkle with paprika to desired spice level. Spread the nuts on a parchment-lined baking sheet and allow to cool. Serve!